Added by Indo American News on August 15, 2013. HOUSTON: AIM for Seva co-hosted a program, appropriately entitled “Teaching the Unreachable”, with the University of Houston’s India Studies Program on the evening of Thursday, August 8, which focused on AOS’ mission and work. The program was held at the Rockwell Pavilion of the M.D. Anderson Library on the Main Campus and was attended by almost 60 community members where they heard about AIM for Seva’s goals and the work it has done so far. The inspiration and guidance for this all-India organization comes from His Holiness Dayanand Saraswati who started the movement with the goal of reaching out to millions of rural and tribal children who have no access to schools and giving them the greatest gift of all – the gift of literacy – which would help lift them out from the centuries-old mire and cycle of poverty. Krishna Mudan, Board Member of AIM for Seva warmly welcomed the gathering and explained the unique model of AIM for Seva’s Free Student Homes (FSH) or Chatralayas, each of which house about 15-80 children. What is novel about this model is that the children are provided not just with the basic necessities of shelter; clothing, schooling and nutritious meals but also tutoring and mentoring along with recreation facilities, yoga classes and a value based moral education. Presently, there are 100 Chatralayas or FSHs spread across India and the aim is to increase this number to 200 by 2020. The results are heartwarming with a 100% pass rate in School Board exams and many children go on to pursue graduate studies or technical and vocational training. Every child that is educated creates a positive ripple effect within the community and what makes it so rewarding is that several of them choose to stay back and work to uplift their villages. AIM for Seva’s work is not restricted to just education and children but also extends to primary programs health care and women empowerment. Organizers estimate that more than 100 million people have been impacted by this movement so far. Mudan expressed pride that Houston’s chapter of AIM for Seva has built four student homes and partially supports ten more. 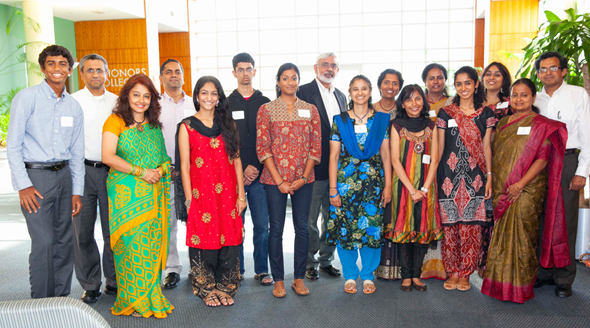 In order to give the gathering an eyewitness account, Mudan invited two youngsters – Ashwin Harish, a 10th grader from a local Houston area high school and Hamsika Chandrasekhar, a graduate of MIT who is now heading off to Stanford Medical School – to talk about their experiences in working with AIM for Seva. Both spoke eloquently about their visit to a FSH in India, what they saw and how it affected them. Ashwin said he saw the light of hope and pride in the children’s eyes and wondered if one can ever put a value on a child’s life. His visit to India made him realize how fortunate he was and he implored the audience to give generously because every cent meant so much to these children. However the most captivating moment of the evening came when a petite, confident girl walked up to the mike and addressed the gathering. Her story is the stuff movies and books are written about. One of three daughters of a widowed mother, Sheetal Pundir joined the AIM for Seva FSH in Rishikesh. She recalled her initial struggle and despair but her mother’s encouraging words kept her going. She went on to win national scholarships and is currently at the University of Ottawa working towards her Ph.D. in Biochemistry. She claimed that” if she did the impossible, it was because AIM for Seva made it possible.” Her grit and determination had the audience spellbound and hanging on her every word. When Sheetal returned to her seat she received a standing ovation. These heartwarming stories come at a cost and, as Mudan put it, “is the price of a cup of coffee a day.” It takes $450 a year to sponsor a child and this year Houston has a target of sponsoring 120 children. So far, $48,000 had been raised but AIM for Seva is aiming to raise $100,000 which they hope to achieve with their next fundraising event – Prabhavati, a classical dance performance about an Asura princess by Rukmini Vijaykumar – which will take place on October, 4th,. Dr. Visweswaran, a prominent supporter, called AIM for Seva’s work a noble mission and recalled Swamiji’s explanation of the meaning of compassion which is empathy – the ability to put oneself in another’s shoes and feel his pain. When asked how one can inculcate compassion, Swamiji’s advice was to fake it and make it – the meaning being that if one keeps pretending to be compassionate, it becomes a reality after a while. He also revealed a lighter side to Swamiji by narrating an incident about the time when an American asked him why he was growing his long beard. With a twinkle in his eye, Swamiji replied that he was not growing his beard, it was growing by itself. If the American has posed the question as to why Swamiji was not cutting the beard, then he would have answered the question! The evening ended with a song “Bharaata Desa Hitaaya” composed by Swamiji which enjoins every Indian to serve their country, to touch the remotest parts, alleviate poverty and bring prosperity to India. At the conclusion of this, guests were invited to proceed to a delicious dinner catered by Dakshin.